(1) Check all parts and system of a new concrete mixer according to the operating instruction before putting it into use. Then, start the machine without any material and check the rotation of drum and blades. Confirm every device is normal. 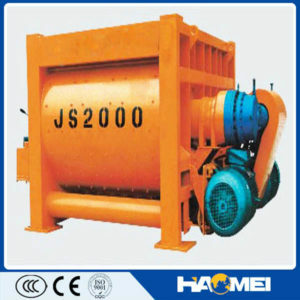 (2) Stationary concrete mixer should be installed on firm pedestal. To mobile concrete mixer, it should be installed on flat and solid terrace and fixed with square timber and bracket. (3) To the concrete mixer that should dig pit underground to feed material, the entry should be blocked up to avoid the water flowing into it. (4) After starting the concrete mixer, you should make sure the drum reach a normal speed when loading materials. And then add water in time. To add new materials, you should unload the primary concrete before. Don’t make the machine half-way down or run it with full load. (5) In the process of working, ensure that gravel cannot fall into the machinery to avoid breaking down the parts. If troubles are found in the working process, please cut off power firstly. Then remove the concrete in the drum and make reparation.